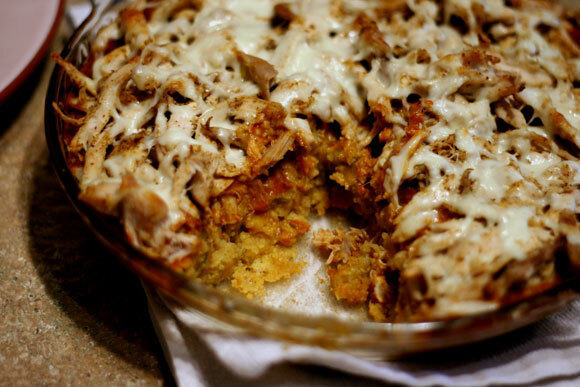 This Tamale Pie is easy to make and delicious. I had cooked the chicken the day before, so all I had to do was assemble the pie and throw it in the oven. Stir together milk, egg, 1/2 Tablespoon taco seasoning, ground red pepper, corn, cornbread mix and green chilies in a large bowl until moistened. Spray a pie pan with non-stick cooking spray and pour cornbread batter in the pie pan. Bake until golden brown, about 25-30 minutes. Toss the shredded chicken with 1 Tablespoon taco seasoning. After baking the cornbread, poke with a fork all over the top. Pour on the enchilada sauce. Top with chicken and cheese. Bake until the cheese is melted and chicken is hot, about 15 minutes. Let rest at least 5 minutes before serving and top with cilantro. Sounds delicious! Some of my favorite flavors.